Here it is: The new phone that was so exciting the company went ahead and skipped a full number upgrade (the Samsung Galaxy Note 6 is lost to the annals of history alongside Ghostbusters III and Freddy vs. Jason vs. Ash). But just like those sadly abandoned sequels, the creators had other plans for the series. 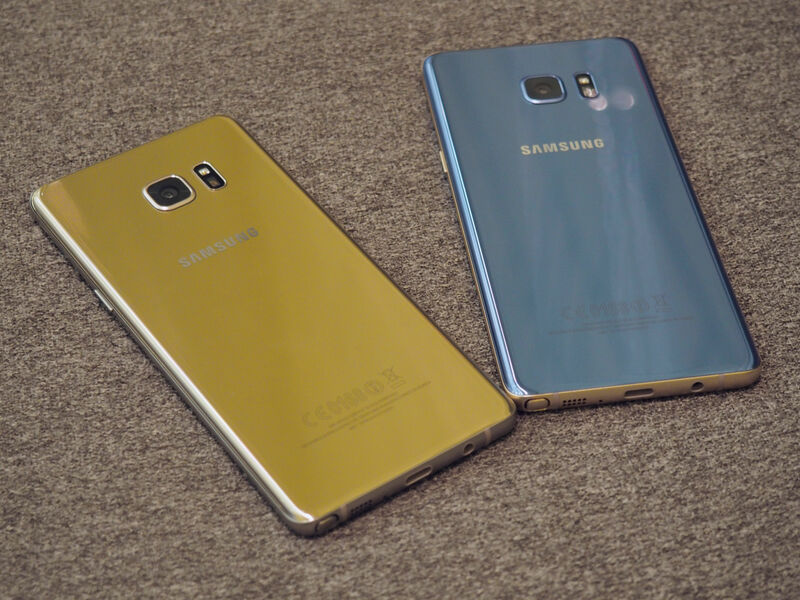 In the case of the Note 7, that means a unification across Samsung’s Galaxy Note line, pulling the phablet up alongside its septuagenarian siblings, the S7 and S7 Edge; most notably, aesthetic consistency across the lines is the real reason for forgoing the sixth installment. That means, as promised, a dual-edged curved display for the 5.7-inch smartphone, bringing the virtually bezel-free curvature to the line for the first time. The rear of the device is also getting a familiar curvature, all part of the company’s long-standing mission statement for the line: bringing a big display to a smaller and smaller form factor. The company promised to do away with all of the “unnecessary edges” in the process. And, indeed, the Note keeps smallifying in a nice way. This latest version fits really comfortably in the hand, no longer the unwieldy unholy phone/tablet hybrid of days of yore. 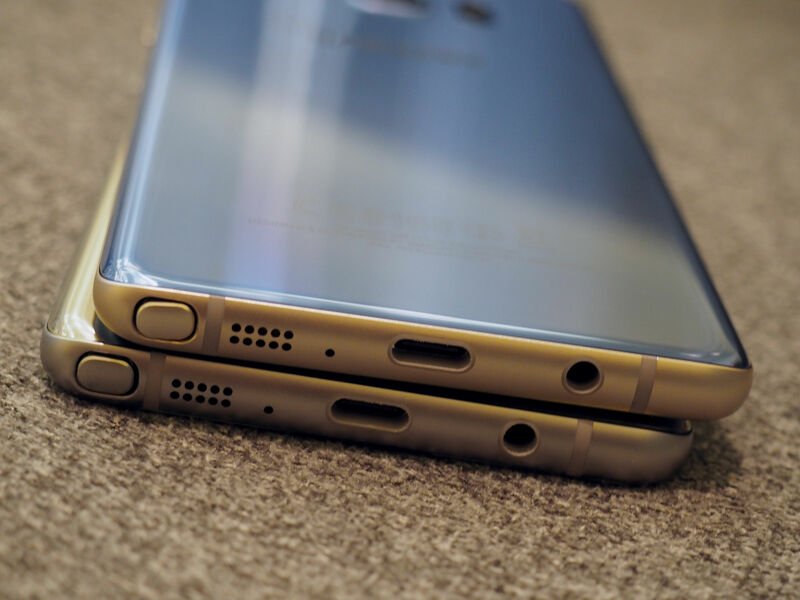 That’s due in no small part to some precious millimeters the company has managed to shave off the handset’s width, from 76.2 down to 73.9 millimeters. And while this version is actually a few fractions of a millimeter thicker than its predecessor, the company has managed to knock a couple of grams off the weight, down to 169. Form factor aside, the display is pretty much the same — and that’s perfectly fine, maintaining the 2560 x 1440 quad HD, working out to 518 pixels per inch. Like I said, perfectly fine. And then some. The processor, naturally, has gotten an upgrade to an octa-core (2.3GHz quad + 1.6GHz quad) Snapdragon — the same processor you’ll find on the S7 — again with the cross-device parity. 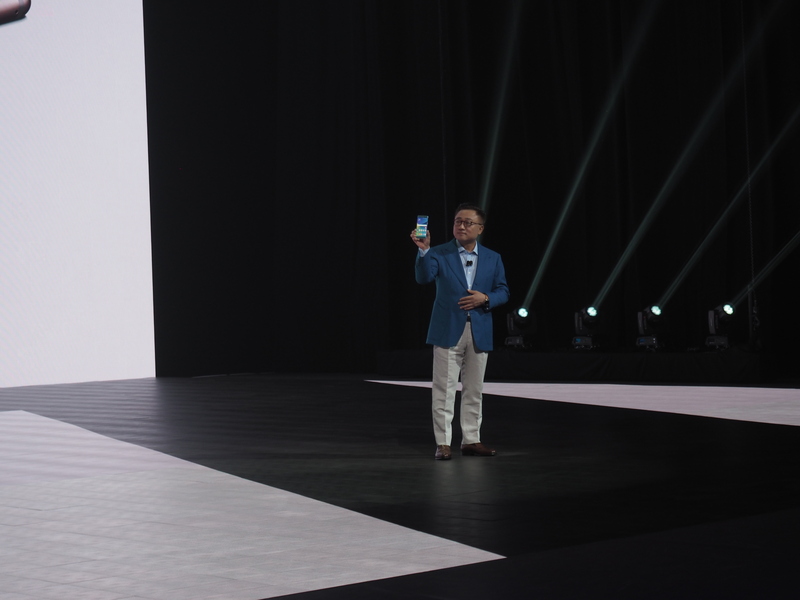 The storage is now 64GB standard — Samsung’s done away with the 32GB variant, leaving only the one on-board option, but letting users expand up to 256GB by way of a microSD slot. There’s still 4GB of RAM here, while the battery has gotten a notable upgrade, up 17 percent, from 3000 to 3500 mAh, which the company promises should charge in about the same amount of time, courtesy of the new USB-C type charger (the handset also ships with a free adapter). 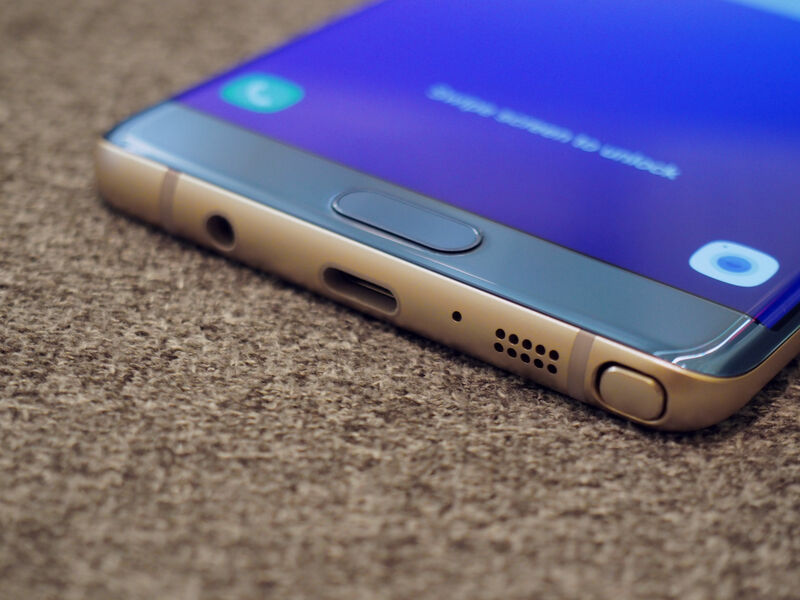 The rear-facing camera, meanwhile, is 12 megapixels — the same you’ll find on the S7. The Note’s also getting a new color, in addition to the standard gold, black and silver — what the company is calling “coral” blue, a soft, metallic color the company describes as “not too masculine, not to feminine.” It’s nice; certainly less harsh and industrial than the dark navy blue the company has been pushing. 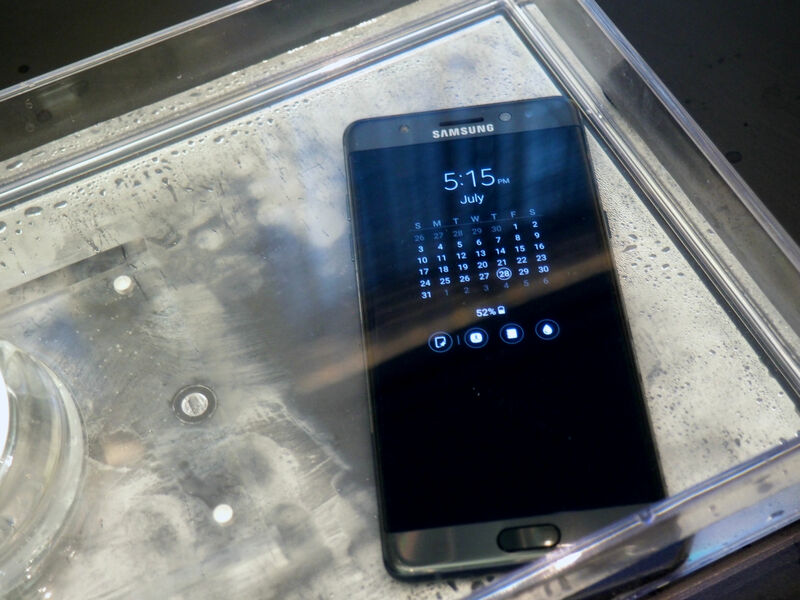 The new Note is water and dust resistant for the first time, with the S Pen scoring an IP68, which means, in real-world terms, that the device is protected from water immersion up to one meter — a fact the company was more than happy to show off at the phone’s debut, along with the impressive fact that the stylus is capable of writing on a wet display, should you have to jot down something important during a downpour. It happens to the best of us. The stylus itself has also been shrunk down. It now weights three grams and has a 0.7 millimeter tip — roughly the size of a ballpoint pen. Among its new tricks are the ability to pin a memo to the always-on display, like a permanent sticky pad, text magnification up to 300 percent and hovering over text for real-time translation (with 31 supported languages, in all). When drawing, it’s now able to blend colors like a watercolor painting, and those drawings worth saving can be shared via the integrated Pen Up social network. There are a few new security features worth (ahem) noting, as well, namely the iris scanning screen unlock, which works impressively fast — in fact, I had trouble snapping a still image of the thing. 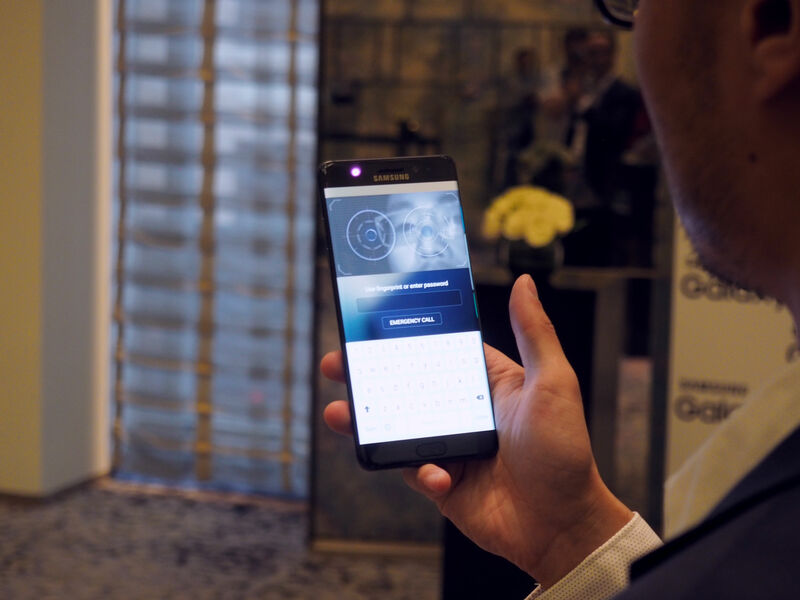 Samsung Knox is included, as well, along with a fingerprint scanner and a new “Secure Folder” designed to keep files secure for those who share devices with different users, such as families. Pre-order for the new Note starts tomorrow. It’s set to hit retailers like Target, Best Buy and Amazon on August 19. Pricing is still TBD and will most likely be officially announced through the company’s carrier partners (AT&T, Sprint, T-Mobile, US Cellular and Verizon). We do know, however, that the company will be offering the forthcoming handset in a number of different bundles. Those who get in early will also get a free Gear Fit2 or 256GB memory card, and everyone will get one of five gaming packs good for free downloads. We’ll be back with a full review of the new Note in no time, but from the early look, it’s shaping up to be a worthy upgrade to Samsung’s much-loved line.